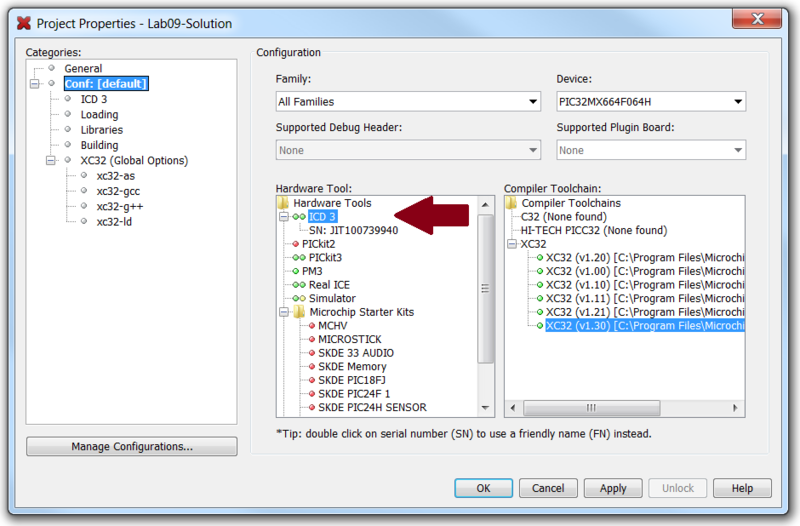 Within MPLAB X IDE, it is very easy to select a hardware tool to work as a programmer/debugger. Just follow this two-step process. Open Project Properties window and select the hardware tool that you want to use as a programmer/programmer. Make sure the tool is connected to the PC and target device and correct drivers have been installed so that you see the serial number for that tool displayed in the window. Also make sure the tool has green light for the device selected for your project for full support. For tools that display a serial number, click on the number to select the specific tool to be associated with the project. For example, in the screenshot on the left, an ICD 3 is connected and its serial number is displayed immediately below the ICD 3 node. If you had multiple ICD 3s connected, each one would display its serial number in the list. If you want to use this tool as a debugger, click on Once the device is successfully built and programmed, the tool will be employed as a debugger and start running. If you want to use the tool as a stand alone programmer, click on This will build the code and program the target device. Once programming is complete, the tool can be disconnected from the target device.